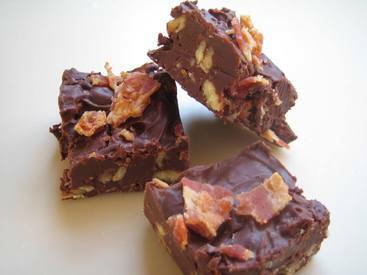 Sweet and salty chocolate bacon fudge! A pound of chocolate and a pound of bacon? Add a half pound of nuts? Sounds good. Let's pig out on some Chocolate Bacon Fudge!! 1. Line an 8 x 8 inch baking pan with foil. Grease the foil with cooking spray. 2. In a medium saucepan, combine the chocolate, milk, butter and cream. Cook over low heat and stir until chocolate melts and mixture is smooth. Remove from heat. 3. Crumble bacon and reserve 1/4 cup. Stir pecans and remaining bacon into chocolate mixture. Spoon mixture into prepared pan. Smooth top with spatula. 4. Sprinkle reserved 1/4 cup bacon over chocolate mixture, pressing down gently. Cover and chill for 4 hours or until set.